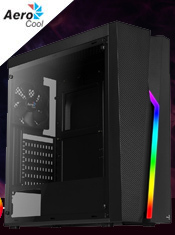 CiT Serenity Micro Gaming (MATX) Black Chassis is the perfect ultra silent solution, it comes with a fully enclosed design, both side panels are equipped with EPDM sound dampening material perfect for reducing the amount of noise that comes from your system. The interior comes with a split metal structure design making it easy to install your components. The airflow is enhanced not only by a 120mm fan at the back which is included but you also have room for 3 fans at the front as well. The front panel comes with mesh inlets on both sides offering excellent airflow intake, good for heat dissipation. 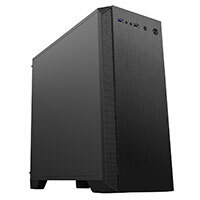 This is enhanced further by the PSU shroud and separate hard drive bays optimising ventilation making it an excellent choice for creating quiet PC system with great cooling capabilities. Located on the front panel is the I/O ports with 1 x USB3.0 for fast data transfer, 1 x USB2.0 and standard audio jacks, along with an aluminium brushed effect for a unique and professional look. The Serenity can also fit 6 internal hard drive bays, 4 x 2.5 SSD / HDD and 2 x 3.5" HDDs. Silent Chassis - A fully enclosed design with EPDM Sound dampening material on both sides help reduce the noise and vibration. Compatibility - The Serenity can fit a max. CPU cooler (Height): 155mm and a max. VGA card (Length): 335mm and supports universal hardware which is easy to install. Excellent Air Flow - Mesh inlet on both sides of the front panel and a fully enclosed PSU and separate drive bays can optimise ventilation, reduce noise and dissipate heat. 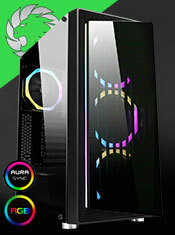 Rear Fan - A 120mm silent fan is included at the back of the Serenity offering excellent cooling and with room for 3 more fans at the front you can enhance your cooling further. Internal Hard Drive Bays - The serenity can fit up to 6 internal hard drive bays, 4 x 2.5" SSD / HDDs and 2 x 3.5" HDDs.